Hope you have all had a very blessed Christmas and are looking forward to a fantastic 2014! What did you do this Christmas? Start a new tradition? Keep to the old ones? Let's talk Christmas in retrospect today! Happy 2nd day of Christmas (and 3rd, since this post will be up both days). I hope your true love has given you something more practical than the symbolic turtle doves and French hens. Today is also another holiday, Boxing Day. Although Boxing Day is not celebrated as such in the United States, the occasion is one of our heritage. So, even though we don’t recognize the day as a holiday in the U.S., let’s look at the history and practice today. Boxing Day’s history is sketchy. As a child, the vague references in books to the holiday conjured up questions of why everyone in a country would go boxing the day after Christmas. ☺ Later I learned the day has nothing to do with pugilism. According to Wikipedia, the day is a carryover from early Roman times when slave owners and servants traded places for one day or when slaves were given gifts at Saturnalia. Perhaps this is what evolved into the British custom giving gifts to servants and those of lesser status on the day after Christmas. According to David Johnson, historians say the holiday developed because servants were required to work on Christmas Day, but took the following day off. As servants prepared to leave to visit their families, their employers would present them with gift boxes. So why don’t we celebrate the day in the United States? In my opinion, one reason is that the classes were muddled/huddled and early settlers lacked the formal distinctions of the “old country.” Especially as people moved West, they were considered equals. Yes, money still talked, but Western society formed a new order in which people were judged more on character and productivity than ancestry. Fewer people had servants. At least that’s my take on the day. According to Elaine Lemm, Boxing Day was a day off for servants and when they received a “Christmas Box” from the master. The servants would also go home to give “Christmas Boxes” to their families. A box to collect money for the poor was placed in Churches on Christmas day then opened the next day. Great sailing ships when setting sail would have a sealed box containing money on board for good luck. If the voyage were a success the box was given to a priest, opened at Christmas and the contents given to the poor. Boxing Day is a time to spend with family or friends, usually those not seen on Christmas Day itself. With guests often popping in for a snack and quick drink, the food and drink on Boxing Day is more relaxed than Christmas Day. 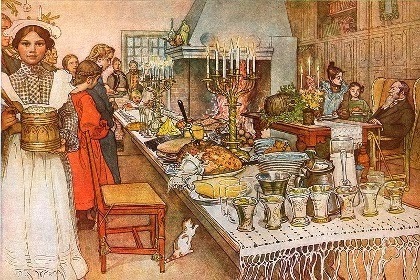 Lunch will usually be a buffet or leftovers from Christmas lunch. Baked Ham is a popular Boxing Day meat. Mince Pies with Brandy Butter or a slice of Christmas Cake are almost obligatory. Boxing Day hunts are now without a fox. In recent times the day has become synonymous with sport. Horse racing is particularly popular with meets all over the country. Many top football teams also play on Boxing Day. 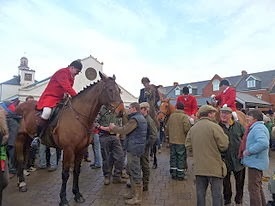 Until 2004, Boxing Day hunts were a traditional part of Boxing Day but the ban on fox hunting has put an end to the hunt in its traditional sense. Hunters will still gather dressed resplendently in red hunting coats to the sound of the hunting horn but it is now forbidden in law to chase the fox with dogs, so the dogs now follow artificially laid trails. Boxing Day is also a time when the British take part in activities like fun runs and charity events. The New Boxing Day Sport is shopping similar to Black Friday sales in the U.S. 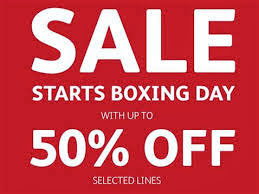 Sales used to start in January post-New Year, but the desire to grab a bargain and for shops to off-load stock means many now start on Boxing Day. Boxing Day is also the Feast of Saint Stephen. For those who keep saints’ days, this is a day to give to the poor and to the church. Certainly that’s a good idea regardless of your religious persuasion! Here are the lyrics to the song that first alerted me to the Feast of St. Stephen, "Good King Winceslaus." Happy Boxing Day. Happy St. Stephen’s Day. Happy 2nd and 3rd day of Christmas. I hope your true love gives you something more useful than calling birds and French hens. Peace, health, and happiness to each of you in the New Year! In the early 1700s New England, Christmas was not celebrated in the colonies. In some it was even banned, and those caught celebrating would be fined. The Puritans and Calvinists considered Christmas to be similar to the Catholic pomp and idolatry, or worse, the pagan rituals of the Druids. The Quakers in the Pennsylvania area didn't regard Christmas any different from any other day. Stores were open, there was no more baking than normal and no Christmas porridge on Christmas Eve. As time passed and more immigrants moved to the Americas, they brought their traditions with them. Eventually the laws against celebrating Christmas were lifted. 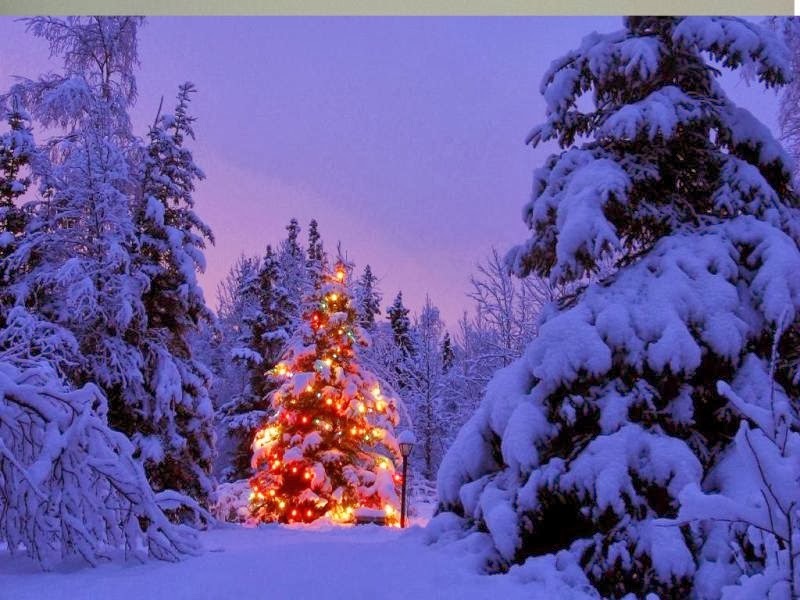 In 1856 Christmas was made an official holiday in New England. For the Anglicans, the holiday began with the Christian liturgical year, the four week period before Christmas. Time was spent in religious services, fasting, praying. It was also a time of reflection, anticipation and expectation for the coming of Christ. Both churches and homes were adorned with all types of greenery, especially those with colorful berries. Mistletoe and Holly along with evergreens were favorites. Evergreens were shaped into wreaths and tied into boughs. They added color and fragrance to their homes and were the most common decorations until the Christmas tree was introduced by Prince Albert in Victorian England. Mistletoe was popular in the 18th century and was arranged in large clusters and tied with ribbons. The bundles were major focal points in colonial homes. The hanging of mistletoe resulted from an ancient Druid belief that it warded off evil spirits and promised fertility of crops for the coming spring. Families attended church services, Christmas carols and hymns were sung. The most most popular of the time were those written by Isaac Watts. He wrote "Joy to the World," "The First Noel," "God Rest Ye Merry Gentlemen," among a few. The giving of gifts wasn't as big a thing as it is today. Contemporary shops would set up displays of typical gifts such as little books, candles, and candy. It was not uncommon to give a cash tip as a gift. 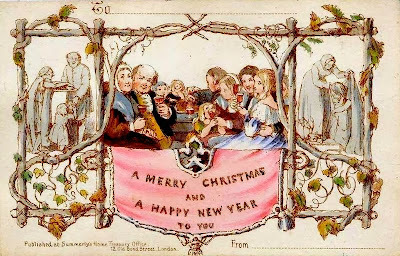 The Christmas card as we know it was introduced in the 1800s along with Santa Claus and the filling of shoes, and eventually stockings, with candy, fruit, nuts, and other small gifts. 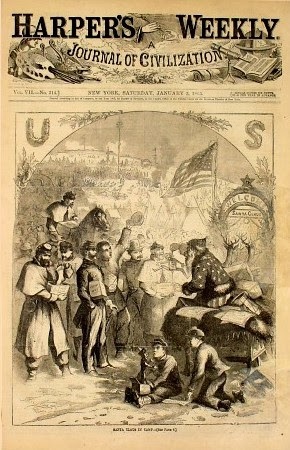 Christmas during the Civil War. As you read in my post on December 4th here on Sweethearts of the West, Christmas feasts were extravagant for those in the cities and on farms where livestock and wild life was plentiful. For those in the wilderness and homesteads far from town, celebrations were simple in comparison. Activities of this era did not center around the children, but rather around the adults. Children were not welcome at the fox hunts, the balls and parties. And the celebration didn't end on Christmas Day. Our ancestors didn't know what we know about the 'twelve days of Christmas'—twelve days between Christmas and Epiphany on January 6th, because Christmas day had a different connotation back then. 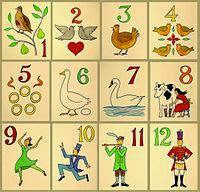 They believed the twelve days began on Christmas day and continued for a full twelve days. Nor did they have the extravagance of Santa in his sleigh filled with toys and presents under the tree. Christmas on the prairie was often a difficult time, especially if facing blizzards and December storms, but every effort was made to celebrate, no matter how small or meager their supplies. 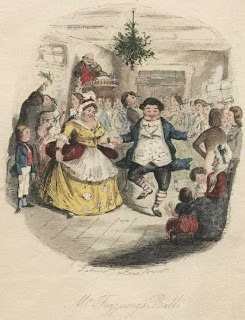 Some people who rarely went to town, made a trip before Christmas for extra supplies, shoes and clothing which was often given to the family as gifts. Around remote military posts, soldiers could be heard singing carols, and venison roasted on an open fire filling the air with a pleasing aroma. Writer Washington Irving wrote about the explorations of Army Captain Benjamin Bonneville in the Oregon territory. They were friendly with the Indians and Kowsoter, the local chief, invited the entire company to a feast. Following the meal, both Indian and white men competed in games of strength and ability. If the home had room, which many early prairie homes did not, there was a Christmas tree. It might have been a cottonwood, scrub brush or a tumble weed. Every effort was given to making it look festive. Bits of ribbon, berries and popcorn strings, pieces of colored paper and possibly candles. The candles were placed in tin holders and when lit, were never left unattended for fear of fire. Gifts were most often hand made—knitted scarves, mittens, socks, dolls made of fabric (rag dolls), and stuffed with straw and miniature quilts. Boys received wooden toys like tops or other toys made from available wood. Some gifts were placed on tree branches, others were place under the tree. Those traveling west on wagon trains also celebrated. Dinner would be sausage, biscuits, rice and game if available. Pies and cakes would be baked and served with precious commodities brought from home—preserves, tea, coffee and possibly a fruit cake they'd saved for the occasion. 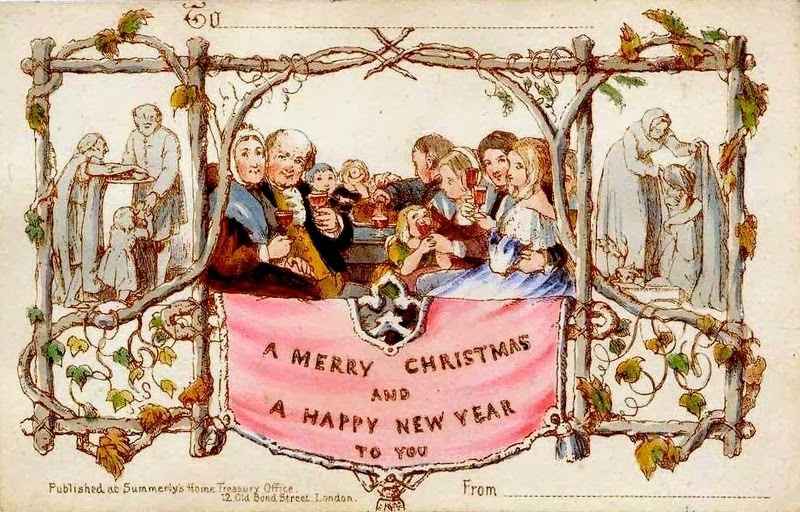 This is the first commercially produced Christmas card. It was designed John Callcott Horsley for Henry Cole. I hope you've enjoyed this sample of Christmas customs and celebrations in our country. Unfortunately I was unable to find any pictures of Christmases on the prairie. I hope my descriptions will paint a picture in your mind. Writers Guide to Everyday Life in the Wild West. Thank you for stopping by. I hope you'll leave a comment. Whose idea was it to have Christmas in the first place? Why December 25, a day no one could prove was Jesus’ birthday? Turkey dinner, holiday cards, decorated trees, mistletoe, carols, Santa Claus—who came up with all these traditions? vities of a rival religion they felt threatened Christianity. For two centuries after Christ was born, the actual day of the event was unknown, and in truth, few people cared. Death days counted more at the time than birthdays. Religious leaders felt that, since Christ was divine, his birth date didn’t matter. In fact, the Church taught that observing Christ’s birthday was sinful and demeaned Christianity. Theologians, however, disagreed and proposed several different dates: January 1, January 6, March 25, and May 20. Of all these days, the latter one became the most popular because of the statement of Luke that the shepherds who received the announcement of Christ’s birth were watching their sheep by night. Shepherds guarded flocks day and night only during the spring lambing season. At all other times the sheep were penned and unguarded. The final straw that forced the Church to legitimize December 25 as the day of the Lord’s birth came about because of the growing popularity of Christianity’s major rival religion, Mithraism. Pagan Romans, still in the majority, celebrated Natalis Solis Invicti, the “birthday of the Invincible Sun God,” Mithras. This cult came into existence in Persia and took root with the Romans in the first century B.C. By A. D. 274, Mithraism was so popular with the masses that the emperor proclaimed it the official state religion. Church fathers decided the time had come to do something about their rival. So, to give their converts a chance to enjoy a celebration they could take pride in, Christ’s birth was officially recognized. Of course, by their dictate, the day was to be one of prayer at a special mass. The celebration of Christmas took hold and stuck. Upon the occasion of the baptism of Roman emperor Constantine, Christianity was proclaimed the state religion. I'd like to take this opportunity to wish everyone a very happy Christmas and a healthy and prosperous New Year. 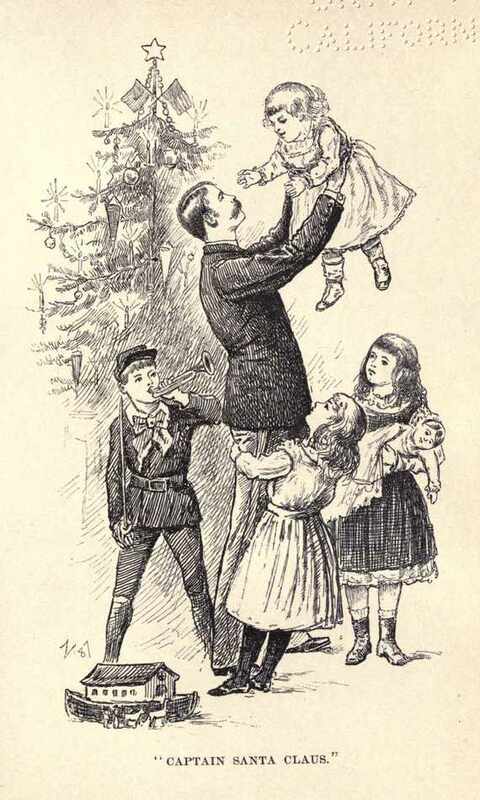 Every child in the garrison, Officers’, soldiers’, laundresses’, civilian employees’ little ones were all there and each and every one found a toy, an apple, an orange, a bag of candy and popcorn ‘galore.’ Santa Claus appeared and appointed Major Brown and Lieutenant Barth, Twelfth Infantry, to distribute the gifts. Monday, December 25, 1876. Clear and cold 28 below. Came off guard in the morning and to the quarters the rest of the day. Having a good drink. Corn, peaches, jelly, butter, duff (a stiff flour pudding) and roast beef and gravy and whiskey drinks. . . Half the company were drunk before night. Not a very merry Christmas! Christmas eve of 1884 found us not in the Holy Land. 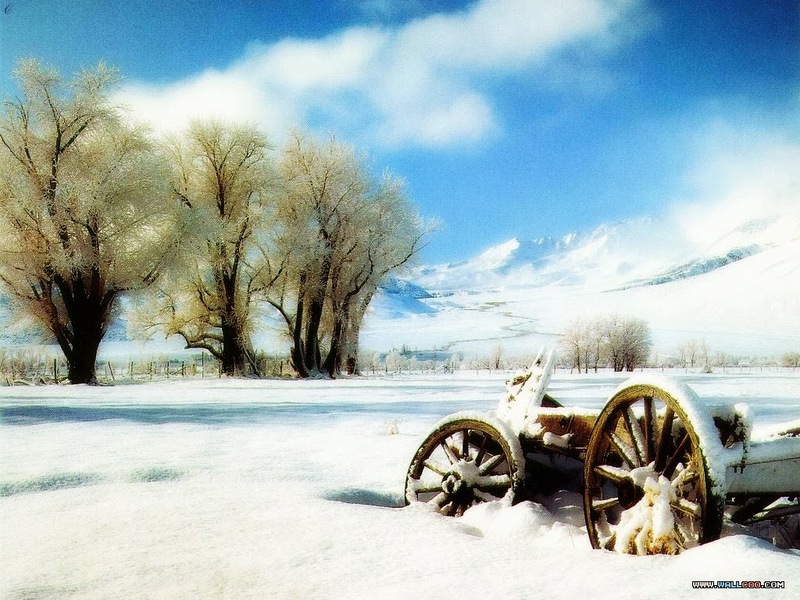 The Bethlehem for troop L, First Cavalry, in the year of 1884 was within the fastness of the Little Rocky Mountains, Montana, on a day when a temperature of forty-two below zero painfully penetrated to the very marrow of man and beast. In the field near Camp Verde, Arizona, contract Surgeon Henry R. Porter wrote a letter to his father at Christmas, 1872. I will close by wishing you all a Merry Xmas and Happy New Year. I should like to be there and eat one of Mother’s famous apple dumplings or plum puddings but I shall be obliged to content myself eating my Christmas dinner on the ground and made up of whatever we can get. Let’s remember the soldiers who served then and now in far off places, away from their loved ones during the holidays, often under terrible conditions, and be grateful for their service to our country. Sarah McNeal is a multi-published author of several genres including time travel, paranormal, western, contemporary and historical fiction. Sarah is a retired critical care/ER nurse who lives in North Carolina with her four-legged children, Lily and Liberty. Besides her devotion to writing, she also has a great love of music and plays several instruments including violin, bagpipes, guitar and harmonica. 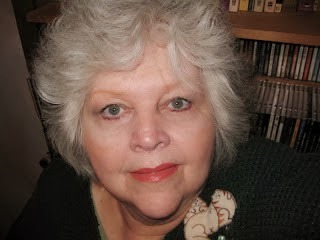 Her books and short stories may be found at Publishing by Rebecca Vickery, Victory Tales Press, Western Trail Blazer and Prairie Rose Publications. When I lived in Nebraska back in the Dark Ages we now call the 1960’s, I spent the winter battling below zero temperatures, ice several inches thick on the back roads, endless snow, blizzards and my car doors often frozen shut in the morning. Clothes would freeze on the line before I finished hanging them up and my fingers would go numb with the cold. Winter seemed endless and the sun would disappear in a grey sky for days on end. I often wondered how pioneers made it through the brutal winters without kerosene, gasoline, matches or grocery stores. How could they put on enough clothes to ward off the relentless wind and bitter cold? Where did they get enough food to make it through the winter? I went on a search to find out how those pioneers lived through the ferocious winters of the northwest. Since winter could last from September until June, preparation was key to survival. Harvesting crops that would last over winter meant they had to choose root vegetables like carrots, potatoes and beets that can endure. Dried apples and corn worked well and salted meats also lasted over time. Light was essential since it was common not to have windows in the cabins. Most often, without kerosene handy, women made candles by pouring tallow (animal fat) over thick string. Sometimes they just stuck a string in a cup of grease. Sounds icky, doesn’t it? They also used pine knots soaked in grease and, during winter, the light of the fire served as light. Without matches, flints were often used to spark a fire in a little dry brush or moss. On occasion, people would walk for miles to ask a neighbor to give them fire in the form of embers to take home. Without fire, there would be no survival. The thick walls of log cabins helped to insulate against the cold as long as the cracks between the logs were filled with mud, rags or paper. It must have been rough stuck in a cabin days on end in the winter months. They did have entertainments. Some played musical instruments creating music to break the monotony. They also read, sometimes aloud, shared stories, played games or just had conversations before the fire as they mended clothing or farm equipment. It sure would be nice to have conversations these days, but there are so many distractions with TV, computers and cell phones that do everything but wash the laundry. Knowing what the pioneers endured to survive winter makes me respect their skills, tenacity, resourcefulness, fierce self-reliance and love of independence. These pioneers demonstrated the true spirit of what it is to be an American. If you can survive winter in the northwest with only rudimentary resources, you can do just about anything. I have lived in log houses twice. The first log house was once a carriage house on an old plantation that was converted to a very comfortable house with an open stairway to the upstairs that allowed heat to warm the bedrooms and bath. That house was toasty in the winter and somewhat cool in summer. The second log house was the one where I was raised. When it was built, somewhere in the early 1800’s, it had two rooms downstairs and two upstairs. 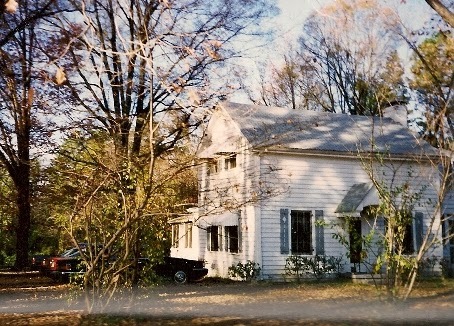 The kitchen was a detached building in the backyard that was converted to a potting house in later years. My dad spent a lot of time in there. In the 1940’s the new owner renovated the house adding a dining room, large kitchen, bathroom, screened in porch and a room with huge windows upstairs. Upstairs wallboard was put up and pretty wallpaper applied and downstairs, every room had cedar paneling and bead board ceilings. They must have loved French doors because they were everywhere. The floors had wide oak boards instead of the more modern narrow boards. The huge fireplace in the living room heated the downstairs well enough until the end of October. When winter began in earnest, my dad would bring in and reconnect the oil heater that sat in the living room and used the fireplace chimney as its smokestack. My sister and I hated that heater, but we were grateful for its warmth when we got up to the cold in our rooms. We would make a bee-line downstairs to dress. We had electric blankets so we didn’t really suffer on cold nights. Later when my oldest sister inherited the house, she introduced central heat which allowed for the enjoyment of the fireplace in winter. Because the walls were so thick, you could sit in the windowsills. One of the previous owners added clapboard to the exterior and a regular tile roof. Except for the exceptionally wide windowsills, you could never tell the main part of the house was made of log. Although we were pretty cozy in that house, we lived in the south with relatively mild winters compared to the north Midwest. Speaking of winter in the Midwest, here is an anthology just released from a brand new publisher that Cheryl Pierson and Livia Washburn put together to celebrate Christmas in the west. It includes stories by 8 western authors and 8 recipes that are mentioned by each author in her story. 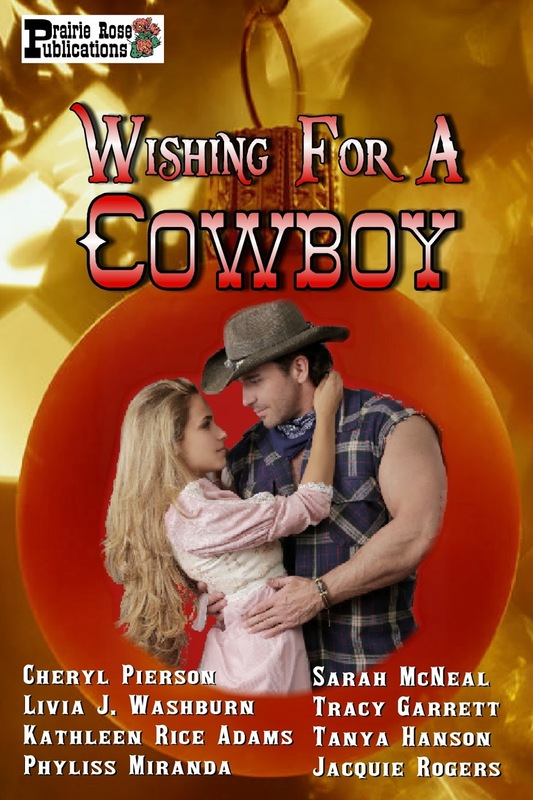 Wishing For A Cowboy Christmas stories will warm your heart. My contribution is A Husband for Christmas. Jane Pierpont and her son, Robin, survived the Titanic, but her husband went down with the ship and the emotional scars of that night have kept her and her son locked into that frightening event years later. Robin is terrified of deep water and Jane has nightmares and survivor’s guilt. She yearns for a family, a loving husband and maybe another child, but she feels disloyal to Michael’s memory whenever Teekonka RedSky comes near her. I wish each of y'all a wonderful, warm and safe Christmas. When I was asked to contribute to the Christmas anthology, Wishing for a Cowboy, I jumped at the chance. When I found out the theme was a Christmas food, my gram’s springerle cookies just jumped into my head! I clearly remember the lemony yet licorice-y taste of these little “picture cookies” from my childhood, but more than that, I remember just dreaming over the rolling pin. So in my story Covenant, I have my hero Carsten Green carving cookie molds and a rolling pin from events of his mail-order bride Ella's life. Sadly, my gram's springerle recipe disappeared over time, a well as her story-telling rolling pin. But King Arthur Flour has generously given permission to use their recipe and pictures. I’m seriously thinking about Amazon-priming a rolling pin of my own and trying out the recipe this Christmas! I know, I know I better get started! From my homestead to yours, Merry Christmas in Jesus’ name. And may all your dreams come true in 2014! 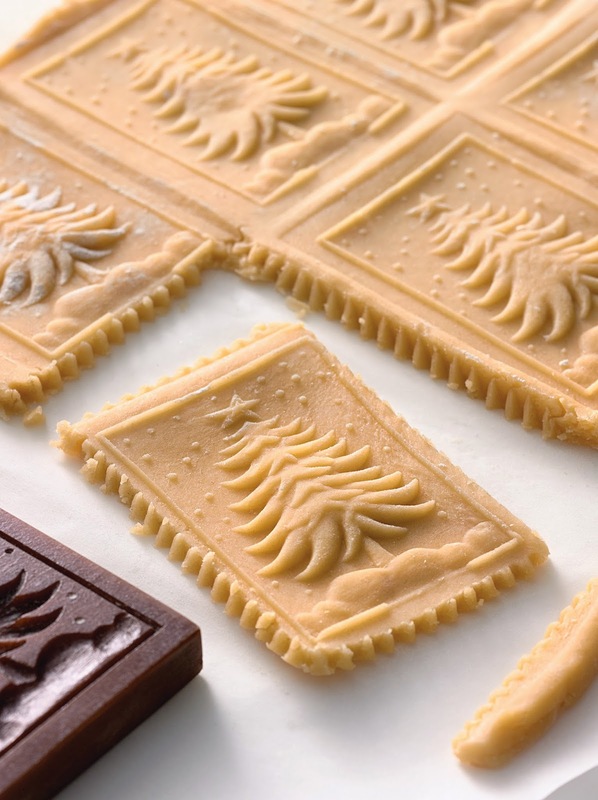 To get the lovely scalloped edges like in the photo, simply use a pastry crimper/cutter to cut your cookies apart. So pretty! 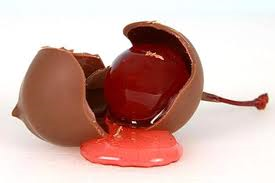 2) In a large bowl, beat together the eggs, salt, confectioners' sugar and flavor for 5 to 6 minutes, until the mixture is very light and falls in thick ribbons from the beater. 3) Gradually beat in the flour to form a stiff dough. 4) Transfer the dough to a well-floured work surface and knead with your hands for several minutes — it will seem dry at first, but will become smooth as you work with it. Wrap the dough in plastic wrap and let it rest at room temperature for 30 minutes or so. 5) To shape cookies using a springerle pin: Dust your work surface lightly with flour. Divide the dough in half and work with one piece at a time, leaving the other piece covered. 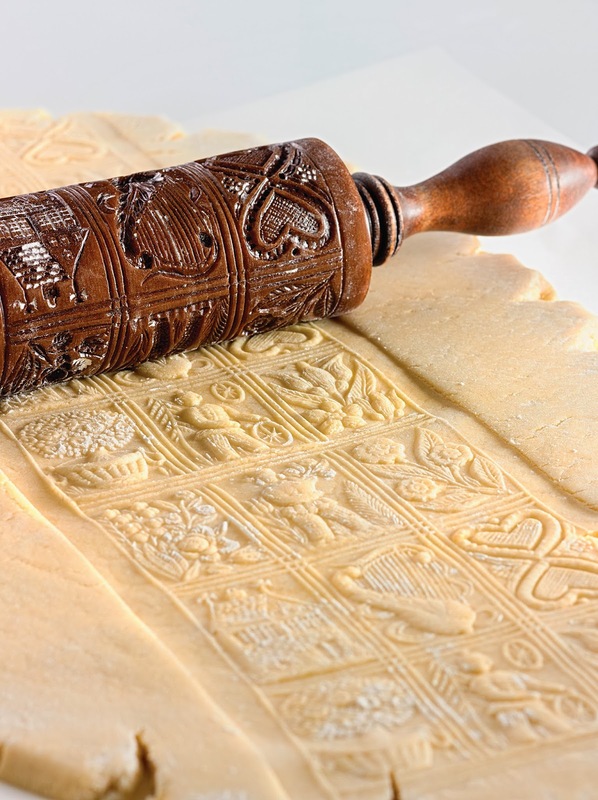 Use a regular rolling pin to roll the dough into a 1/4"-thick rectangle, roughly the same size as your springerle pin. 6) Use a pastry brush to brush a very light coating of flour onto the dough. Flour your springerle pin, then give it a couple of sharp raps to knock off excess. Slowly roll the springerle pin over the dough, pressing down hard enough to leave a good impression. Cut the cookies apart on the lines, with a pizza wheel or sharp knife. 8) Press the lightly floured mold firmly into the dough. Remove the mold and cut around the design with a knife. Repeat until all the dough is cut. 9) Transfer the cookies to the prepared baking sheets. If you're using anise seed, sprinkle it on the cookie sheet or the parchment before laying down the cookies, giving them extra flavor. They'll also raise the cookies just a bit, allowing air to circulate around the bottom, drying them thoroughly. 10) Set the unbaked cookies aside to dry at room temperature, uncovered, for 24 hours. Turn them over once during the drying time to allow the bottoms to dry. 11) Preheat the oven to 275°F. 12) Bake the cookies for 25 to 30 minutes, until they're firm but not brown. (If the cookies are a bit puffy, and the design isn't as sharp as you'd like, bake the next batch at 250 degrees for 35 to 40 minutes.) Remove them from the oven and transfer to a rack to cool completely. 13) Store the cookies in an airtight container. To keep them from becoming rock hard, we suggest placing a piece of soft bread, a slice of apple, or a cookie softener in the container with them.